Click image to access the report. As we begin a new year, the State of Connecticut faces daunting challenges. Each feels more pressing than the last and it’s hard to know where to even start. But efforts in one policy arena hold promise for creating a ripple effect that would contribute greatly to our state’s economic development, fiscal sustainability, public health, and more. If we support a holistic approach to education, we can transform prospects for prosperity across the state so more young people can realize their untapped potential. And better still, we know what’s needed to produce the results we seek for all students. A growing body of evidence, culminating in a major report released yesterday, confirms that preparing students for success in school, career, and life requires educating the “whole student,” inclusive of crucial social and emotional skills in addition to education’s traditional focus on academic instruction. 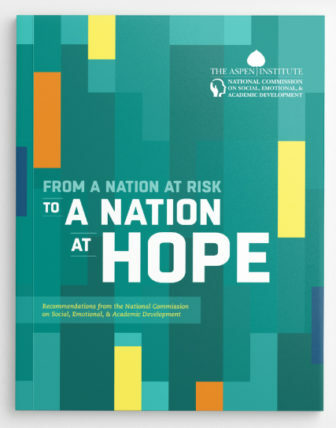 The report, From a Nation at Risk to a Nation at Hope, issued by the Aspen Institute’s National Commission on Social, Emotional, and Academic Development (SEAD Commission), compiles decades of research and reports on two years’ worth of conversations, meetings, and site visits that the SEAD Commission conducted across the United States, connecting with students, parents, educators, community leaders, and other experts. 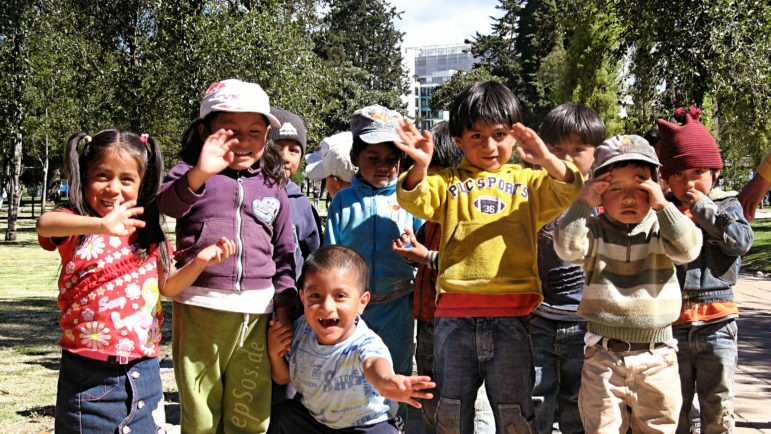 Research and on-the-ground experience confirms that cognitive, social, and emotional development are inextricably linked. Children with more developed social and emotional skills are more adept at paying attention, setting goals, persevering, thinking critically, and problem solving. They act with responsibility, honesty, and integrity. They’re more empathic and compassionate. And their grades, graduation rates, and post-secondary outcomes improve. Longitudinal studies also show students with these skills thrive later in life at work and become successful members of society. We want Connecticut to lead the nation in this work. It seems only fitting. The movement to educate the whole child began 50 years ago here in our state, launched by Dr. James Comer at the Yale Child Study Center. From the seeds Dr. Comer planted, myriad approaches to social and emotional learning (SEL) have sprouted across Connecticut. One promising approach is scaling rapidly. With the support of superintendents and school boards, the Yale Center for Emotional Intelligence has partnered with more than a hundred schools in dozens of districts across the state in implementing RULER, a systemic, evidence-based approach to SEL. The approach improves academic performance and emotional intelligence, reduces teacher stress and burnout, and enhances school climate and relationships among students, teachers, and administrators. Students in RULER schools also report less anxiety, depression, and bullying. In districts where RULER has been adopted, such as Bridgeport Public Schools, now in its 5th year of implementation, the approach is proving to be enduring and sustainable because SEL is infused into the curriculum, policies, and culture of the district. And once educators are trained, the cost of maintaining it is low. Empowered by the new flexibility created at the state and local level through the federal Every Student Succeeds Act of 2015, Connecticut can act on the recommendations of the SEAD Commission. We can invest in integrated programming that explicitly teaches students social, emotional, and cognitive skills; supports educators’ wellbeing; and embeds the development of these skills in school-wide practices and academic instruction. SEL transforms learning environments, creates schoolwide cultures that foster strong, supportive relationships and student voice and agency, and affirms the cultural backgrounds of our state’s diverse learners. And when we build partnerships among schools, families, and community organizations a holistic approach to education benefits students’ lives both in and outside of the classroom. SEL is essential for success in school and life. Now, more than ever we know how to do it right. We must invest in school and community programs that already have a strong SEL component, and encourage those that haven’t yet embraced SEL to learn more. The future prosperity of our children and our state depends on it. Marc Brackett is Founding Director of the Yale Center for Emotional Intelligence and Professor in the Child Study Center at Yale University and serves on the SEAD Commission’s Council of Distinguished Scientists. Barbara Dalio is Co-Founder and Director of the Dalio Foundation. Fran Rabinowitz is Executive Director of the Connecticut Association of Public School Superintendents. Robert J. Rader is Executive Director of the Connecticut Association of Boards of Education. The Dalio Foundation provides funding to the Yale Center for Emotional Intelligence, and has funded the SEAD Commission since 2016.